Veterinarians are reporting seeing increasing numbers of cats suffering from poisoning after eating portions of lilies out of flower arrangements. 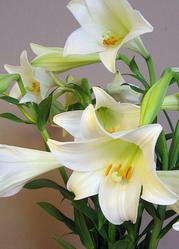 Dr Matthew Retchford, President of the Australian Small Animal Veterinary Association (ASAVA), a special interest group of the Australian Veterinary Association, said that cats can die after eating small portions of lilies. "Lilies seem to becoming more popular in flower arrangements and veterinarians are reporting seeing more cases of poisonings," said Dr Retchford. "All parts of the lily are poisonous to cats - flowers, stamen, stem, leaves and roots, but for some reason, dogs and other pets are not so badly affected. "The first signs of toxicity, which is usually within the first few hours, include vomiting, depression and loss of appetite. Acute renal failure may set in within one to three days," he said. "We would encourage people to keep flower arrangements away from cats, but the key to successful treatment is early treatment." Types of lilies that are very toxic to cats include the tiger lily, easter lily, rubrum lily, day lily, glory lily, stargazer lily, japanese show lily, asian lilies.